Rainforest Fund (hereinafter “RFUND” or “The Fund”) is a non-profit organization that supports projects to protect the rights and lands of indigenous and traditional populations throughout the world’s rainforests, and since 1989, RFUND has worked throughout Latin America, Asia and Africa to fulfill its mission. The Fund operates within the interest of the public and project beneficiaries and strives to maintain the highest code of conduct in all of its activities and operations. RFUND acknowledges that members of the Board of Directors and other individuals representing or affiliated with the organization may encounter possible conflicts of interest or instances in which an appearance of conflict of interest could be detrimental to the Fund and its constituents. 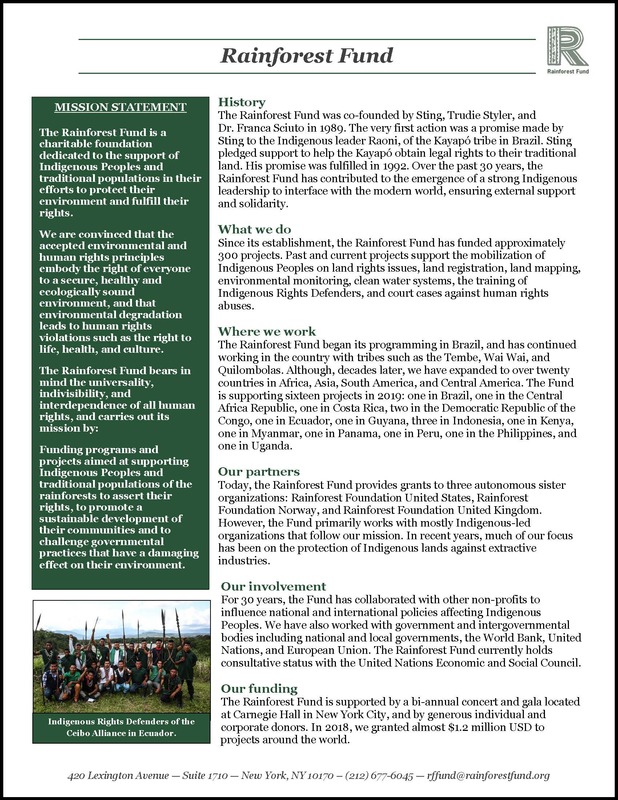 RFUND adopts the following Code of Conduct in recognition of: RFUND’s responsibility to the public; the importance of fairness and objectivity within business; the need to assure that every decision is made in the interest of the Fund and the communities it serves; and, publicly codifying its expectations of the Board, staff, volunteers and all others who serve the Foundation. 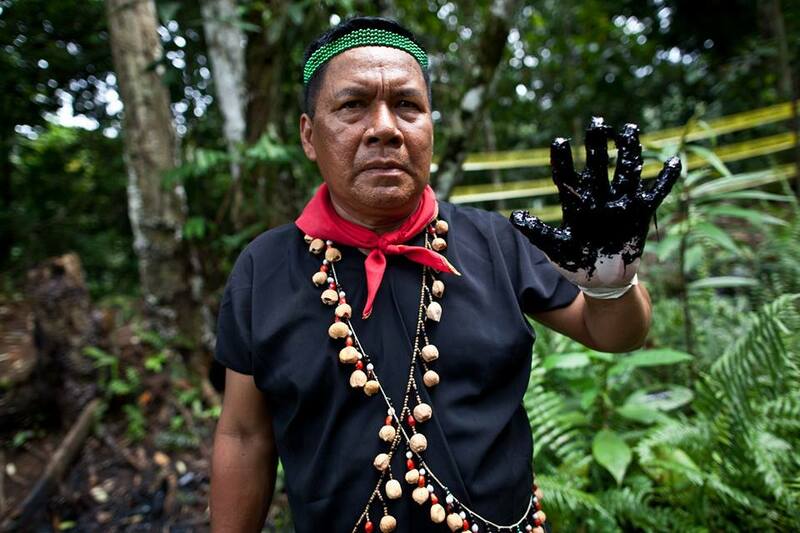 Further, this Code of Conduct applies to all persons retaining a position of responsibility and trust on behalf of Rainforest Fund, which includes and is not limited to members of the board of directors, members of the board of directors of supporting organizations, staff, volunteers, interns (all of which are hereinafter “Members”). Each Member will receive the Code of Conduct at the time he or she begins serving the Fund. Members are expected at all times to act ethically and professionally, including the proper use of authority and appropriate decorum. Loyalty to the Fund supersedes any conflicting loyalty to other advocacy or interest groups, business associations, personal interests, paid or volunteer service or any other like organization. There shall be no self-dealing or any conduct of private business or personal services between a Member and the Fund, except when conducted in an open and objective manner to ensure that there is equal, competitive opportunity and access to information. Members must not use their positions to obtain employment at the Fund for themselves, family members or close associates. Should these Members desire employment, he or she must first resign. Members may not attempt to exercise authority over the Fund’s policies and operations except through their respective roles as voting members or specific job related responsibilities and established supervisory structure. Within interactions with the press and the public, Members may not speak for the Fund unless expressly authorized by the Board Chair. Serving on the board of organizations that are or may be grantees of the Fund without the approval of the Chair. Engaging in any activity that conflicts with the mission of the Fund. Engaging in any financial, business or similar relationship with current or potential beneficiaries. Accepting in any form compensation or gift from current or potential beneficiaries; and, likewise, no Member shall provide gifts or favors to others where these might appear to influence relations with the Fund. Failing to disclose to the Chair that an immediate family member is associated with a grantee or beneficiary. The Fund will make public its Form 990 tax returns and audited financial statements; but, Members will hold strictly confidential all issues of private nature, including but not limited to: private businesses, contributions from individuals, businesses and other private entities, and all personal matters. Before a member begins his or her service with the Fund, he or she shall disclose to the Chair a list of his or hers main business activities, involvement with other charitable organizations or any other association that could create a conflict of interest. Further, any duality or potential conflict presented to any Member must be disclosed to the Chair once it becomes known to the Member and must be made a matter of record once the conflict is known. All Members are under a habitual obligation to fully disclose all situations involving conflict or potential conflict of interest whenever they arise. In the event of a Member’s unavoidable conflict of interest, the Member must be given an opportunity to explain the failure to disclose or the actual conflict of interest. Such Member must then remove himself from all deliberation and voting procedures, unless requested by the Chair to 3 provide information or answer questions that may assist in the decision making. In no instance may the Member vote on the matter or attempt to influence the decision. If the Fund concludes that a conflict of interest or an appearance of a conflict of interest exists, the Member will be asked to remedy the situation, and depending on the circumstances, the Member may be subject to termination for having engaged in conflicting conduct or for failing to disclose a situation involving actual or potential conflict of interest. All proceedings must be recorded in the meeting minutes. The Fund notes that this Code of Conduct does not cover all instances in which a conflict of interest may arise or all potential methods of handling conflicts of interests. Members and the Fund shall always carefully consider any potential conflicts of interest and refrain from any action that might be or be perceived as a conflict. The Chair is responsible for carrying out and interpreting the Code of Conduct as it applies to all Members. The Members have the responsibility to report to the Chair any and all knowledge of activities that are or appear to be in conflict with the Fund. Please click here for a PDF version of our conflict of interest policy.